As Printer Ink Cartridges customer base grows, we are adding more items of stock weekly to cope with the demand for compatible ink as all the leading brand manufacturers launch their new range of printers. We now offer a greater choice in the HP, Brother and OKI toner ranges that are now stocked and are qualify for next day delivery to your business for all toner and ink listed below. We are able to offer next day delivery with GLS couriers for all our laser toners that are in stock. If you require toner urgently please contact us to find out if the item is in stock and if next day delivery is possible. 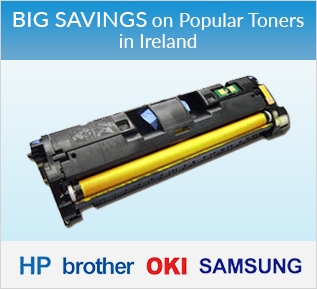 HP, Brother, OKI and Samsung are among the most popular toners in Ireland so we have gone the extra mile again to ensure our prices are the best value in Ireland. Unbelievable twin pack deals starting from 41.99 euro - yes two toner and ink cartridges for 41.99 euro. Our growing sales of these bundle pack offers mean you must order before 3.00pm to guarantee next delivery. The twin and triple pack bundle deals are ideal for those with mono printers (black and white) while the family packs for colour printers offer even greater savings with free toner on offer. The bundle deals offering 1 free black cartridge when you buy the full set of 4 colours start at 159 euro. We also offer larger bundle deals in ink which include two toner cartridges of each colour and two extra free black. The bundle deals that include the free cartridges can be tailored to suit your needs and you are able to specify the colour of your choice as the free toner.